Walking distance to Outlets. Clean, staff was very nice, excellent breakfast options. Rooms were spacious. It was busy for the summer but everything moved quickly. It was a quick, one night stay on our trip. Hotel was undergoing some renovations which accounts for the 3 star rating for facilities. This hotel allows dogs which is the primary reason we chose it. Plus the paid-in-advance rate was very attractive. Visiting family for the weekend. The room was fine, hotel is doing some construction but clean. The bed was a little uncomfortable. Convenient location. The room was clean, very spacious and comfortable. Great breakfast! Wonderfully priced for the area. Would have been nice to check in before 3pm. Saturday night stay at Comfort Suites with my family, we slept great! Very clean, nice staff, and that morning breakfast with sausage and cheese omelettes was the BOMB!! Hotel is located in parking lot of outlet mall. Great location - you can just walk over to shop. Plenty of restaurant options nearby. Hotel staff was friendly and helpful. Breakfast was pretty good but they ran out of waffle batter on our last day there (with 30 minutes to go in the breakfast time allotment). Hotel was very nice and staff was great, but as advertised, it was not a suite. It was a regular two bed room that was switched by putting in hot tub. not what i paid for. This hotel's best features are friendly customer service and good breakfast options - just wish they didn't use so much disposable packaging (how about washable plates instead of styrofoam & plastic). Good stay, close to restaurants and to shopping as well. We arrived on Saturday April, 9 around 3:00. Smooth check-in clean room. NO pool or hot tub both closed for winter. Price did not reflect this. Breakfast was good and well cared for. If your looking for a clean place to stay this is your place. If your looking for a weekend getaway location.....not so much. Nothing really stands out as bad, but nothing really stands out as great. They charge for great. So I'm gonna say average hotel. Stayed one night to visit Biltmore. Room was clean, comfortable and updated. Price was very reasonable and in good proximity to Biltmore. Very pleased with stay. This hotel was in an excellent location for my activities in Asheville & Hendersonville. The room was clean & the staff was very polite. Its proximity to the NC Arboretum was a plus. There's a grocery across the highway, & many restaurant options, as well as the shopping outlet behind the hotel. I didn't need the Wi-Fi service, or fitness center. From check in to check out, we didn't have any issues. When we first got there, late that night, there was little parking due to a large family reunion party going on, but we did find a space. Check in was quick and painless, and the lady at the front desk did state that if we needed to park in the restaurant next door, we could - the parking pass did allow us to park there if need be. Our room was clean and comfortable. And the internet was easy to connect to and fast. The bed was nice, and I loved having the options of pillow hardness' to choice from. Breakfast the next day was okay - it is what you typically expect, but the hot food was hot, and the cold food was cold, so it was good. Overall - had a great experience, and would book it again when I come back to Asheville. Comfortable hotel with pleasant and helpful staff within easy striking distance to the magnificent Biltmore Estate. I would stay here again. All was well: staff, room and bed were very nice, very quiet. The TV remote was broken and the lamp in the bathroom needed a new tube, but the staff was glad to hear about them. On my way home I'll have a little dog with me. I'll stay there again with her, for a small fee. This hotel is near the North Carolina Arboretum, a great place to walk and enjoy the mountain air and scenery. Within a short walk of Asheville Outlets, Comfort Suites Outlet Center is within 2 miles (3 km) of Bent Creek Experimental Forest. This 125-room hotel welcomes guests with free breakfast and conveniences like a 24-hour fitness center and free self parking. Free buffet breakfast is included with your stay and awaits you each morning from 6:30 AM to 9:30 AM. Get a pick-me-up at the coffee shop/café, or mingle with other guests at the free daily manager's reception. Guests can expect to find WiFi and 40-inch a flat-screen TV with cable channels. Pillowtop beds sport Egyptian cotton sheets and the bathroom offers a hair dryer and free toiletries. Other standard amenities include an MP3 dock, a sofa bed, and a sitting area. 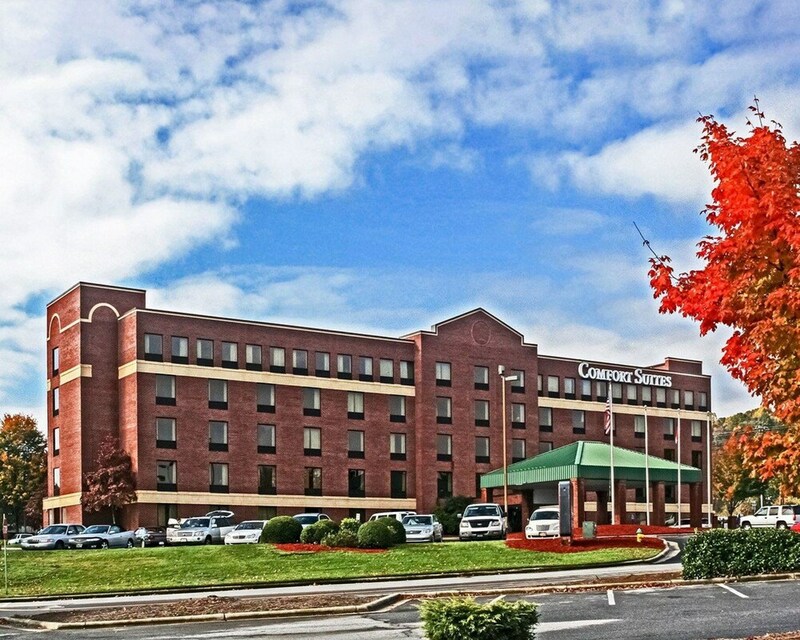 Comfort Suites Outlet Center features a 24-hour fitness center, WiFi in public areas, and a conference center. There's free parking if you drive. The 24-hour front desk has multilingual staff ready to assist with dry cleaning/laundry, tours or tickets, and securing valuables. Additional amenities include a 24-hour business center, coffee/tea in a common area, and a computer station. Dear guest, Thank you for staying with us. We value your feedback. Dear guest, Thank you your positive feedback. We sorry to hear about the bed being uncomfortable, must of the time we get compliments but we are sorry it didn't work out for you. Visit us soon! Dear Ron, Thank you so much for a great positive review! We are so glad that you enjoyed your stay at our hotel. Hope to see you again soon! Dear guest, Thank you so much for your kind review! We hope to see you on your next visit to Asheville. Dear guest, Thank you for sharing your experience online and thank you for your patience with our elevator. We are glad you found our hotel well located and the staff friendly. We hope to see you soon again! Free buffet breakfast is served daily from 6:30 AM to 9:30 AM. Guests can enjoy a free manager's reception daily. Recreation features at Comfort Suites Outlet Center include a 24-hour fitness center. The preferred airport is Asheville, NC (AVL-Asheville Regional): 12-min drive, 8.7 mi/13.9 km. The front desk is open 24 hours a day, and checking in and out are easy with express services. Driving? This property offers free self parking, along with RV, bus, and truck parking. An Antique Retreat at O'kelley's Farmhouse!